FLECONN can customize complex wiring harnesses and looms for international industrial equipment and machinery manufacturers. We successfully designed and produced tens of types of complicated wire harnesses and cable looms. FLECONN can custom complex wiring harnesses and looms for international industrial equipment and machinery manufacturers. We successfully designed and produced tens of types of complex wire harnesses and cable looms. 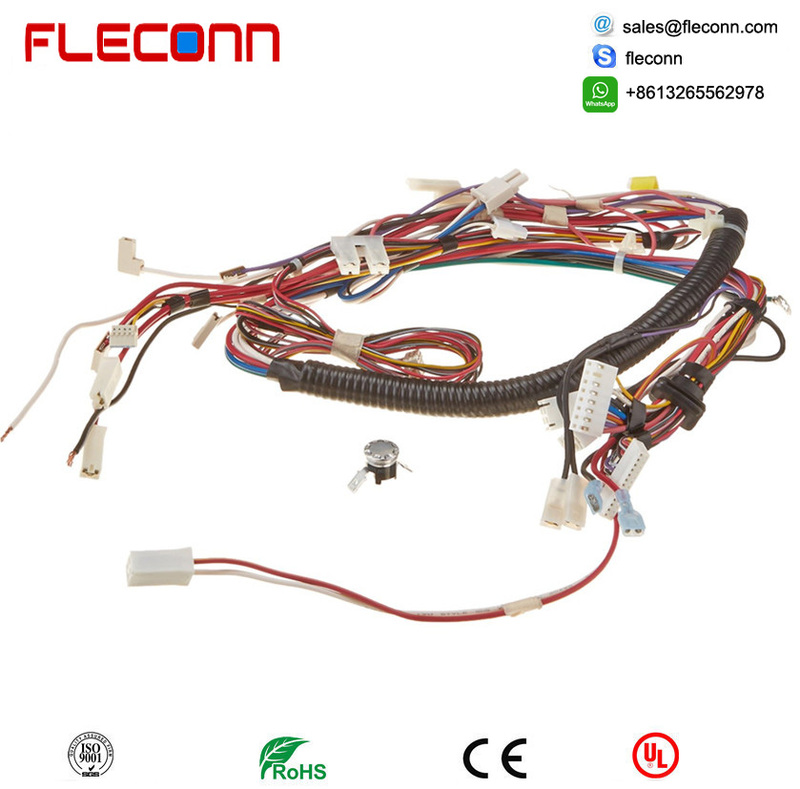 For example, this complicated cable loom included 4 pieces of fan DC cables and 4 pieces of LED strips DC powr cables,reed switch cable, LED panel power cable, high sensor cable, scale plate sensor cable, audio cable. Wire harnesses and electronic circuit board assemblies. 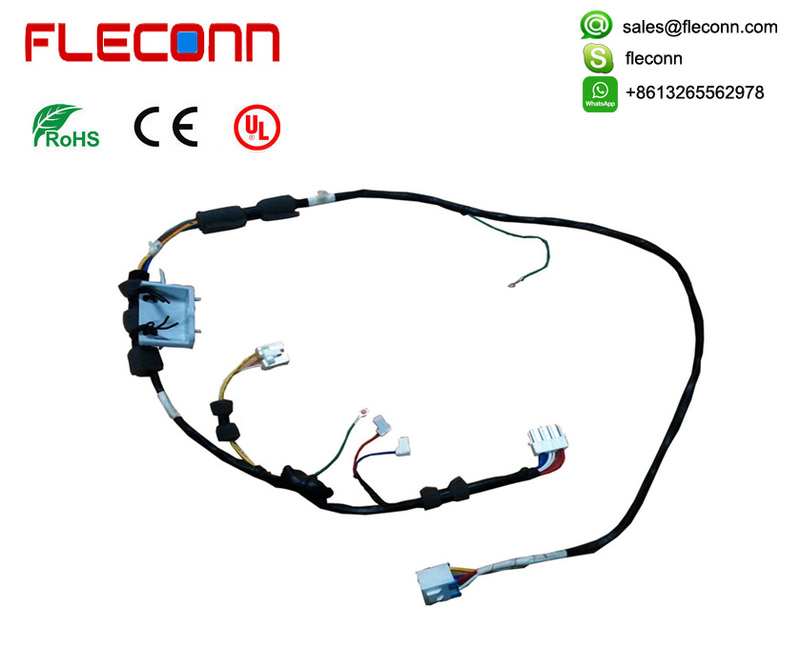 This wire harness is composed of two pieces of matched 24 pin female board connector and 24 pin male wire connector. 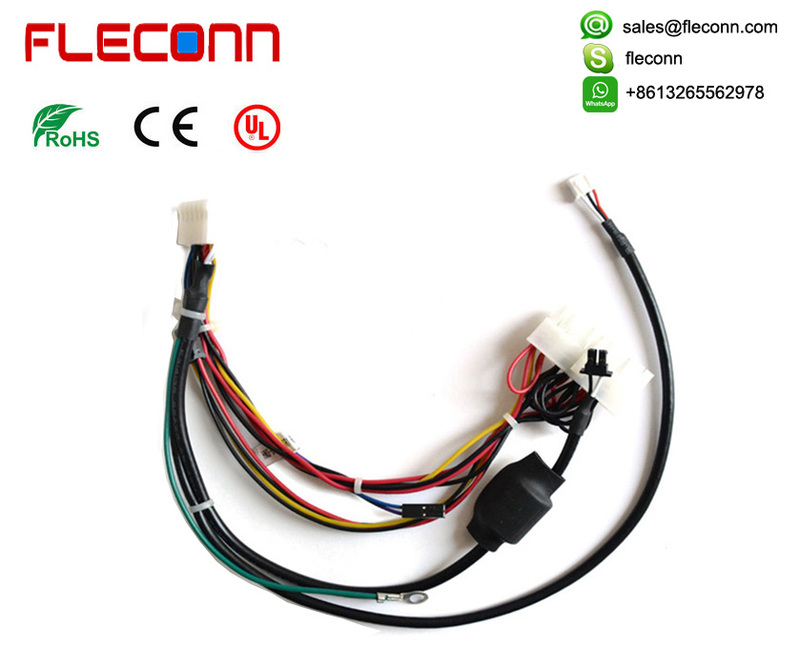 The matched connectors can come true insertion and extraction by one time. All kinds of cables were integrated into one piece of electronic circuit board. Then there were placed several types of connecting ports on the PCB. 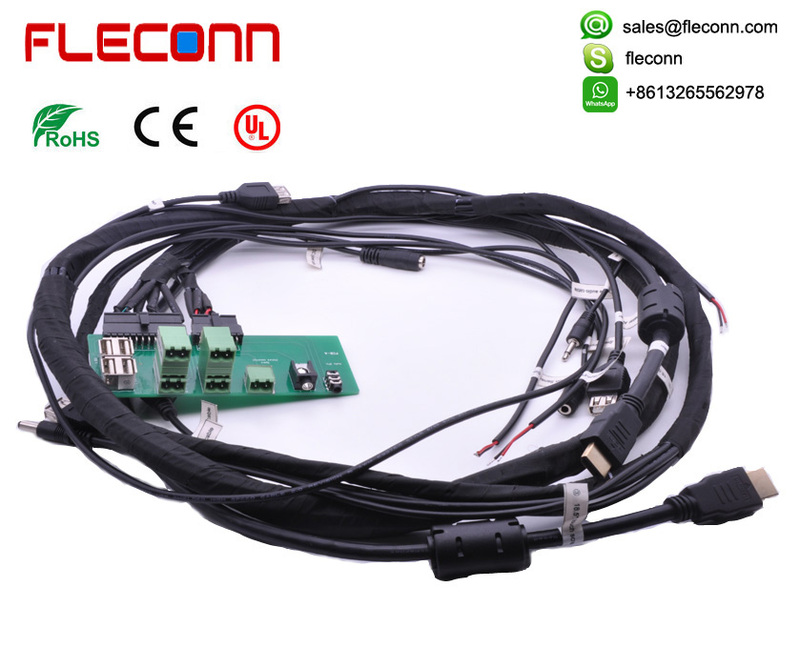 User can connect his correspond devices by defferent ports such USB ports, audio port, double-deck PCB terminal blocks. 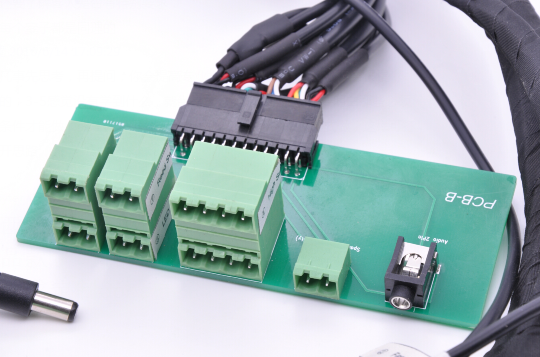 At the same time, we can provide wire to board terminal blocks to match PCB terminal blocks. In this way, we may prepare all related components for our customers and then it will take great convenience for our clients. Our engineers work closely with your team to find the right solution for the most demanding applications by integrating precision connectors, components, parts and engineered cable. The suppliers of these materials may be assigned by customers. Or we can select RoHS, CE, UL certified supplier to provide materials. FLECONN Connectors' skilled technical and support teams help you build the perfect cable assembly for your unique application, providing advice through design, prototype, assembly, testing, manufacturing, installation, and beyond. 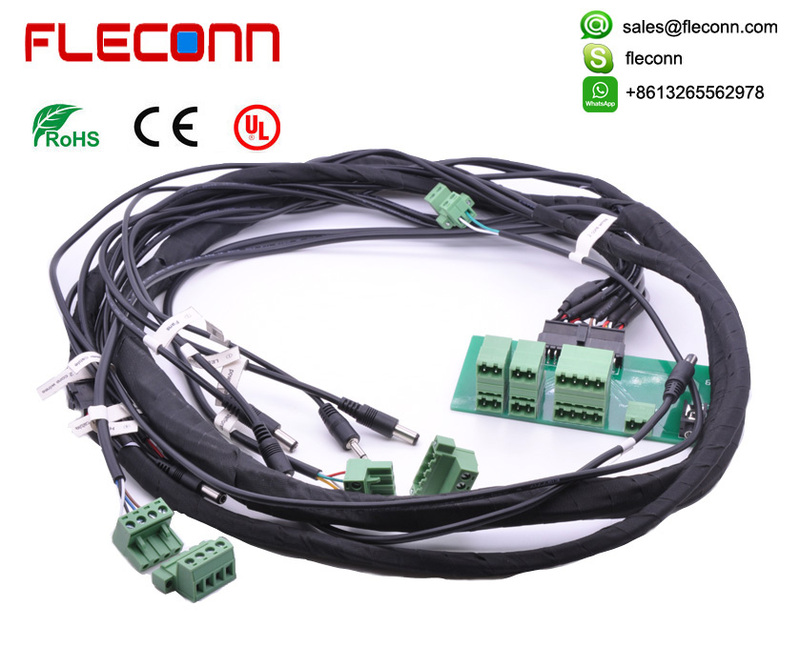 FLECONn engineering team will provide high efficiency and low-costs support to develop, modify or finalize your cable harness assembly’s design and manufacturing drawings by your specifications, meeting your timelines and quality standards. Our ultimate aim is to come true European Quality and Chinese Price.